Coordinators: Joyner R.W., van Santen R.A. The Elementary Reaction Steps in Heterogeneous Catalysis was studies during the first week in November, 1992, by no fewer than 54 participants, drawn from 11 countries, with both industrial and academic backgrounds. 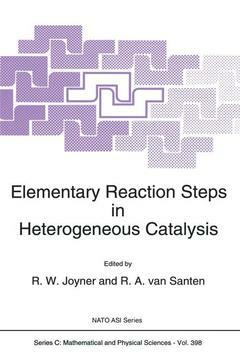 The five sessions reported in the book cover: Catalytic reactivity, Surface science studies in catalysis, In situ methods in catalysis, The contribution of theory to catalytic understanding, and Chemical kinetics and chemical engineering. The book ends with Summary lectures, a list of contributors, and an index. Preface. Introduction. Session 1: Catalytic Reactivity. Session 2: Surface Science Studies in Catalysis. Session 3: In situ Methods in Catalysis. Session 4: The Contribution of Theory to Catalytic Understanding. Session 5: Chemical Kinetics and Chemical Engineering. Summary Lectures. Index.